New for 2017 – The EVH Striped Series 5150 guitar. High spec, high performance and it looks fantastic. What more could a Van Halen fan want? 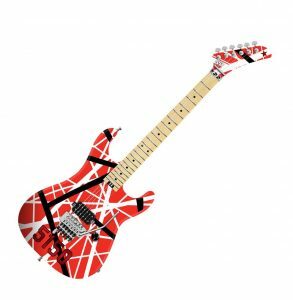 If you are fanatical about Eddie Van Halen then you will as excited as we were that EVH will be launching the EVH Striped Series 5150 in June 2017. Back in 1984 Eddie Van Halen introduced his famous red, white and black striped 5150 guitar. Since then it has been copied but not with such faithful detail as the EVH Striped Series 5150. The guitar is hewn from basswood, identical to the original, and has a bolt on quartersawn maple neck cut with a modified C-profile. The neck has a hand rubbed back finish and a “Hockey stick” headstock. The neck is designed for speed, as you would expect from a Van Halen guitar. It has a compound radius going from 12″ to 16″ and this combined with the hand rubbed finish makes it ideal for replicating those quick Van Halen licks up and down the neck. The EVH Striped Series 5150 is fitted with a single humbucker as per the original 1984 5150 guitar. The pickup is a EVH designed Wolfgang Alnico 2 humbucker. The Wolfgang Alnico 2 was designed with Eddie Van Halen to deliver the perfect amount of power, clarity and sustain. If you want to re-create the Eddie Van Halen chunky brown rhythm tone and scorching clarity for soloing then this is the pickup. The EVH Striped Series 5150 is fitted with a single low friction volume knob delivering even volume tapering to re-create the famous Van Halen volume swells. Finally the guitar is armed with an EVH branded Floyd Rose bridge. Each locking nut tailpiece features fine tuners and there is the patented EVH DTuna on the low E string tuner to allow for instant transition from standard to drop D tuning. If you are looking to re-create all the sound and tone of Eddie Van Halen then this is the guitar for you. If you are not so fussed about Eddie Van Halen but want a high spec guitar that is going to give you tonnes of performance then this also could be the guitar for you. Sadly the EVH Striped Series guitar isn’t released until June 2017 so for the time being you will have to satisfy your desire by visiting the EVH website.